Footprints in the Butter: Living out of my Pantry: Where do I start? Living from my pantry? Where do I start? So yesterday, I talked a little bit about what I mean by living out of my pantry, and a bit about why it is a good idea to be able to. Today, let's attack the subject of HOW? Where do you start? If you go browsing around the web, you'll find some answers to this. Some of them are really straightforward and easy to follow. Some of them are incredibly expensive. Some leave you (or at least they leave ME) scratching your head, still unsure of where to begin. I think for the most part that anyone who is telling you precisely what to do to 'be prepared' is nuts. That would include me. Feel free to tell me I'm nuts if I cross that line! Here is what I suggest. Everyone, everywhere has some type of scenario that is a possibility that would keep you from easily being able to go grocery shopping for a couple of days. Blizzards, hurricanes, floods, or other weather conditions are an obvious culprit. Illness, flat tires, or an unexpected bill might cause a short-term issue too. Personally, I think the best way to start on the road to living out of your pantry is with something small. Can you feed your family decently for three days? If you go grocery shopping every Tuesday, and a storm hits Monday night, would you be okay through Thursday? This isn't just, "could you get by?" What I mean is, can you be calm and not have to worry about what in the world you'll eat if you can't get out tomorrow? Assess YOUR situation. What are the likely causes of your inability to grocery shop? What else does that mean for you? If a storm means you can't get out, does that also leave you without power? Or water? What cooking options are you likely to have? If losing electricity is likely, your short-term living from the pantry plan needs to be heavy on getting rid of stuff in your refrigerator that first day or so. That's not so easy to plan for. If losing water is likely, your living from the pantry plan has to factor water needs in as well. It's only after thinking about those factors that you can start considering what should be in your Short-Term Living out of my Pantry plan. Storms (winter) can cut us off completely from access to any shopping. This does happen regularly. Storms often mean a lack of electricity and water (we're on a well) for at least some of that time. No electric would mean no internet, so I better not need to go google-ing for recipe ideas. It would also tend to mean no heat. We have the stove (propane) as long as we have matches. We have a grill, a fire-pit, various camp cooking implements. The stove is the easiest. So I want meals I can fix in a skillet. I know that I cannot waste precious water on anything where I'm going to drain it off. I can use water for cooking, but it better end up as part of the dish, or be something I can use in a side (using the water from cooking veggies to add to the potato flakes for mashed potatoes, for instance). I don't do dried beans, I don't do much pasta, and I don't want meals that will involve a lot of dishwashing. One-dish skillet meals are best. 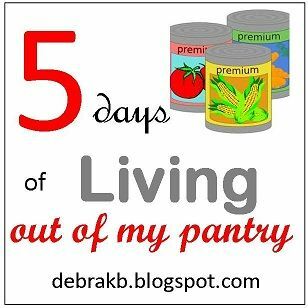 For me, a basic 3-day Pantry plan will involve things like canned meat (chicken, tuna, salmon, etc. ), rice, canned soup or stew, pancake mix, powdered milk, instant potatoes, etc. A first day emergency meal might consist of using up meat thawing in the fridge. I'd come up with a skillet meal based around that. I could throw in veggies from the fridge, or make some rice to serve it over, or add a can of cream of something soup, or... well, it would depend on the perishables I have around. I know not everyone is a "throw it together" cook. My take on cooking is that a recipe is a jumping-off point. It gives me ideas, gets me started, but I practically never follow one to the letter. So emergency pantry cooking is fun -- grab the most perishable thing around and make something happen based on it. If you are someone who does tend to follow recipes, you might want a bit more of a base. This is where canned soup/stew can be nice. Grab a can or two of soup, put it in a saucepan, add some water and appropriate bouillon cubes, and then add extra veggies or other perishables from the fridge. Add some green beans to the stew, add some leftover rice to the chicken vegetable soup. A bit of extra spaghetti sauce can be a great addition. YOU have to figure it out for yourself. But basically, think about the types of things you would normally serve, and see if you can have a small stash of extra... and some easy "I can turn this into anything" items too. I tend to make my own white sauce normally, but in emergency living out of my pantry settings, it is nice to have canned cream of mushroom soup available! powdered milk, instant potato flakes, pancake mix, etc. With the next big batch of meat we get either through butchering chickens or getting freezer beef, etc. I want to try canning some of it. We have cans of tuna and chicken, but would be happier to have the meat we most often on hand.